There's nothing deeper than the Iskar," goes the local folk song, with characteristic parochialism. Even sceptics, however, admit that the longest river running entirely within Bulgarian territory is indeed remarkable. Springing from the plain near Samokov, it flows through the Sofia Plain and the Stara Planina mountains, crosses the Danubian Plain and, after a journey of 350 kms, joins the Danube. The 65 kms squeezing through the Stara Planina are the most spectacular stretch of the river's course. Cliffs and vistas, rock phenomena and caves, monasteries: you have it all in the Iskar Gorge. Travellers passed through the gorge for millennia, but it really owes its fame to the late 19th Century, when a railway was built along it and popular writers Ivan Vazov and Aleko Konstantinov promoted it as a tourist destination. The most obvious reason to brave the bumpy road or the slow train through the Iskar Gorge is its stunning natural beauty. These 65 kms are dotted with rock phenomena like the red sandstone and karst cliffs rising 200 m above the tiny Lakatnik Station. Caves abound in the area around Lakatnik, the most famous of which is Temnata Dupka, or the Dark Hole, the fourth largest in Bulgaria. Lakatnik is popular with climbers and there is a cross on one of the peaks in memory of those who fell to their death. The Ritlite phenomenon near Lyutibrod ‒ four long, narrow rock ridges ‒ and the rock window near Karlukovo are more of the natural wonders of the gorge. The area around Karlukovo is pitted with hundreds of karst caves, large and small. The most famous is Prohodna, a 262-metre corridor bathed with the surreal light from two eye-shaped openings, appropriately named Eyes of God. The Iskar Gorge, however, is not only geography. It is full with history, too. There are few traces today, but Neolithic peoples lived near the village of Rebrovo, and a ruined Late Antiquity basilica survives near Lyutibrod. 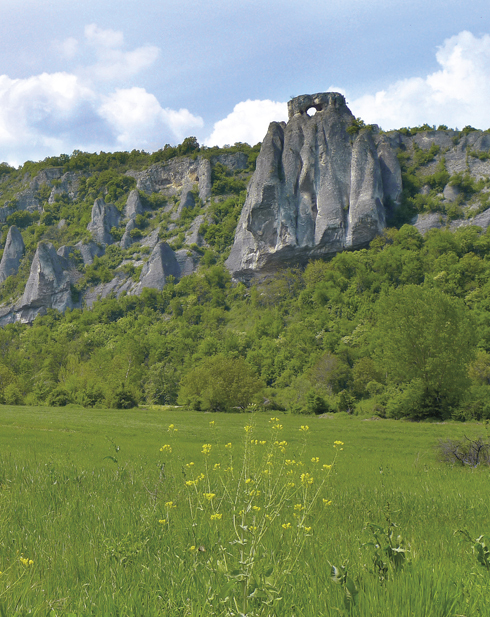 The cliffs around Svoge are dotted with medieval fortresses. When people are not certain about their local history, they invent it. The inhabitants of Bov, for example, say that their village was established in the early 12th Century by a French knight called Sainte de Bauve. The village of Cherepish, another story goes, is named after the white cliffs around it, which in their turn were formed from the skulls of Bulgarian soldiers killed in a battle with the invading Ottomans, in the late 14th Century. Cherepish derives from the Bulgarian word for skull. The monasteries in the gorge have always been a big draw for visitors. One of the most interesting is Sedemte Prestola, or The Seven Thrones, north of Lakatnik. The monastery is now over-manicured, but according to legend it was built in the 11th Century by Petar Delyan, an aristocrat who unsuccessfully tried to restore Bulgarian independence from the Byzantines. There are no thrones inside the tiny church ‒ in this case the word prestol means a chapel, and there are seven of them. The Cherepish Monastery, which was established in the 12th Century, is a must-see, though all the buildings now date from the 19th Century. In spite of over-renovation in recent years, it is still charming, mostly because of its picturesque position on the banks of Iskar, below towering cliffs. The monastery also boasts a dramatic history. Nearby, in the Rashov Dol area, the last men of the revolutionary band led by the poet Hristo Botev were defeated by the Ottoman army on 3 June 1876. Writer Ivan Vazov used this event as a plot device for his popular short story, Edna Balgarka, or A Bulgarian Woman, which is set partially in the Cherepish Monastery. Ivan Vazov loved the Cherepish Monastery, but another author of Bulgarian nature-writing, Aleko Konstantinov, had mixed feelings about it. He cherished the beauty of the place and its surroundings, but was dismayed by the primitive conditions, and recommended that tourists bring their own blankets and food if they planned to spend the night there. Things are different at present, and many Bulgarians now stay overnight. The Karlukovo Monastery is a different matter. At the end of the 19th Century it was demolished to make way for a psychiatric asylum. Its church, with 16th Century frescoes, survives as part of the hospital. The Iskar Gorge is also a place to satisfy your Communist heritage curiosity. Some villages still bear the names of partisans, or Communist guerrilla fighters. Vlado Trichkov is named after the eponymous partisan killed in 1944, and the village of Milanovo bears the name of a participant in the so-called September Uprising of 1923. There is even a British name here ‒ Tompsan Station commemorates Major William Thompson (1920-1944), who was sent to help the Bulgarian partisans, but was caught and executed by the Bulgarian police. The greatest Communist monument in the gorge is near Lakatnik. Perched on a precipitous rock, Pametnika, or the Monument, was built in the 1950s as a memorial to the fallen of 1923. Today, the main reason people climb up there is to enjoy the views towards the Iskar. Probably the most interesting remains of the regime, however, is also one of the least known. It is the ruins of the seminary near Cherepish. In 1950, the Communist authorities nationalised the buildings of the Sofia Seminary and forced it to move far from the capital. The tutors and their students settled near Cherepish and stayed there for the following 40 years. 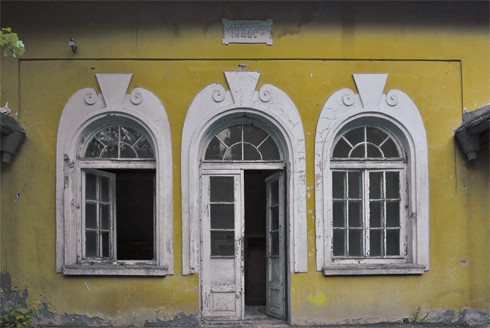 In 1991, they returned to their erstwhile premises in Sofia. The dormitories, the school and the fine church at Cherepish were abandoned and left to the mercy of the elements. Today, it is a creepy place. The only signs that youngsters used to live there are the crosses placed on the high cliffs around. Each of them was installed by a graduating class, as a memorial to their stay in the Iskar Gorge.